Altogether, our INTERACT-trip to Arctic Station was very successful. Thanks a lot to everybody who made this become possible! We managed to obtain the targeted samples and moreover had very nice impressions of the unique nature around Disko Bay. The overwhelming impressions I got certainly made appetite for a revisit. Consequently, I am curious to analyze our samples and looking forward to coming back again one day. See you Disko – Takuss! A Black Guillemot spotted during my stay in Kuannit. Niviarsiaq – the national flower of Greenland is as beautiful as the country. Spectacular icebergs in Disko Bay. Humpback whales breathing in the evening sun. The flag of Greenland – I do hope to see it again soon. The day we left from Qeqertarsuaq the sun came back. The nice weather and calm sea made our boat-trip back to Ilulissat almost feel like a touristic trip. We passed several small villages, spotted a group of humpback whales, and finally sailed through the vast ice-berg field of Kangia. A group of humpback whales in the distance. …as these ice-bergs at the entry of ‘Kangia’. We were sailing through this miraculous ice-landscape for almost an hour. The sea was calm and the sun was shining. As predicted the weather was quite misty and moist on our last day on Disko. Since we had to post-process the remaining samples, we were not bothered much by this anyhow. In the evening, I went for a short walk to a relatively large valley close-by the station. Niviarsiaq – the ‘national flower’ of Greenland at the entry of ‘Blaesedalen’ – the valley with the ever blowing wind. The weather steadily improved, so that we managed to accomplish our field-work – the last 20 control shrubs on the little plateau. Since we still had one day left for post-processing these samples and the weather forecast predicted rain for Saturday 11th, we decided to use the remaining few hours with sunshine to inspect another potential field-site for possible further projects. This place – called Kuannit which refers to the vascular plant Angelica – was characterized by very lush vegetation. Moreover, the place features several basaltic pillars, which characterize the specific geology of the Disko-island on which Arctic Station is located. In combination with the homothermic springs, the resulting fertile soils host plant communities which normally are located further to the south. Our control site on the plateau with Salix shrubs growing close to a little stream. The change in size from close to the stream – potentially also affected by the homothermic springs – to the surrounding tundra (left part of the image) is clearly visible. Male (left) and female (right) flowers of Salix glauca – the ‘Beautiful Willow’. Apart from our research question with respect to homothermic springs, we are also interested in gender-specific growth patterns and levels of productivity. Angelica growing in Kuannit – due to its high content in Vitamin C, the native people use it for medical purposes. Basaltic pillars in front of an iceberg. The landscape at Kuannit is green and lush and features several geologically interesting formations. Since our boots still were wet from the day before, we decided to start post-processing the samples before lunch. This means, that we had to cut the harvested stems into small stem-disks, applying the so-called serial sectioning technique. The idea of this technique is to sample each one stem-disk at certain distances along the stem, which allows for an appropriate cross-dating of ring-width measurements in case the lower parts of the shrubs would not grow any more (so-called missing outer rings which are often observed for Arctic and alpine shrubs). In the afternoon, the weather had significantly improved wherefore we decided to continue our field-work. While we had sampled treatment and control shrubs growing on a slope the day before, we now were aiming at treatment shrubs on a little plateau underneath that slope. We managed to sample another twenty shrubs, so that three quarter of the field-work were completed by the end of the day. Our treatment slope with lush and green willow shrubs. Already from the first visual impression we got that the shrubs growing in close proximity to the springs were taller and featured bigger leaves. Unfortunately, the rain continued on our first day with actual field-work. Nevertheless, we managed to sample each the longest stem of altogether forty willow dwarf-shrubs, i.e. half of our scheduled sample size. Soaked by the rain, we finally came back to Arctic station. I felt as cold as one of the many ice-bergs which were stranded in the shallow bay close to the station. After slowly getting settled at Artic Station (the scientific research station within the INTERACT network), we started exploring the environment for potential field-sites. Our task was to identify 80 suitable dwarf-shrubs which fulfill specific conditions. That is, the main research question within our proposal relates to homothermic springs, which provide 7-8 °C warm groundwater all year round. Since we were interested in studying the potentially positive impact of elevated ambient temperatures and therefore a prolonged growing season in vicinity to these springs, we were looking for sites where we could find shrubs both growing affected by the springs (treatment) and unaffected (control) in close proximity to each other and with otherwise similar conditions. The weather conditions were however not ideal, wherefore my camera stood inside my back-pack most of the time. 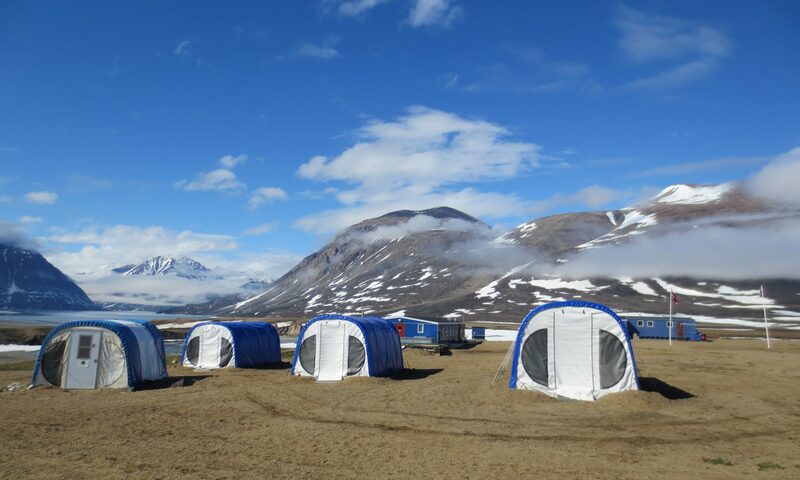 We nevertheless were able to identify several potential field-sites, one of which luckily was located in close proximity to Arctic Station, which would make field-work logistical issues much easier. In the evening the rain stopped, which I used for a short walk to the beach. Arctic Station – the main building is located to the right – with homothermic springs behind the station (light green spots on the slope). The shore of Qeqertarsuaq – altogether roundabout 750 people are permanently residing in the town. Two gulls sitting on one of the ice-bergs in the bay of Qeqertarsuaq. Our travel from Berlin to Qeqertarsuaq went relatively smoothly. After a short stop in Keflavik, we flew over the Greenland Ice-Sheet to Ilulissat. Luckily, the sight was fantastic, though relatively dark since flying around midnight. Nunataks sticking out from the Greenland Ice Sheet. Meltwater lakes on top of the Ice Sheet. Huge crevasses in the Greenland Ice Sheet. After a relatively short night, we then sailed from Ilulissat to Qeqertarsuaq, thereby passing huge icebergs in Disko Bay. After my INTERACT research stay in the Tatra Mountains last year, I this year am heading for Disko Island in Greenland. This year, I’m investigating the ecology of arctic willow shrubs to extend our shrub-ecophysiological understanding and thereby improve shrub-parameter based reconstructions of local climate and environmental conditions. In the following I will share my impressions from the beautiful environment of Disko Island and provide an idea about the success of the field-trip. At half past six the alarm got me awake. After a quick breakfast, Zofia and I went to sample Mountain pines at the first field-site., i.e. a Southeast facing slope at 1700 m elevation. The sampling itself was quite cumbersome, since Mountain pine forms relatively dense patches which were hard to access. By early afternoon we had managed to measure and harvest ten stems. First ring-counts in the field suggested the shrubs to be at least 60 to 70 years. Morning-view from my room in Kłapa research station. A beautiful morning in the Tatra Mountains – perfect conditions for field-work. Left: Mountain pine stem after the sampling (diameter round-about 8 cm), age roughly estimated at 50 years by counting the rings. Right: Mountain Pine forms dense thickets which are not easily accessible. Since by then half of the field-work was accomplished and the weather was forecasted sunny for tomorrow, we decided to leave the remaining work for the next day. Instead I used the free time to repeat a photography taken in the 1960ies which was exposed in the research station and combine this with an evening hike to a close-by mountain. It turned out that the repeat photography could not be taken in perfect match, since the spruce forest had significantly extended since the 1960ies. Nevertheless I tried to match the perspective of the two pictures, whose comparison clearly indicates an upward movement of the tree-line as well as an increasing Mountain pine abundance in the area. The subsequent hike to the Black lake (Czorny Staw) and Karb mountain pass gave me a very nice impression of the High Tatra Mountains. Attempting repeat photography to compare the extent of the tree-line between 1960 and today. The exactly same angle was not possible to obtain since today Norway spruce covers the perspective from the 1960ies. Evening panoramic view on the study-area from 2000 m elevation. The area above the tree-line is largely covered with Mountain pine (e.g. dark-green patches on the west-facing slope in the centre of the image and around the lakes in the valley). In the late evening, Prof. Stanisław Kędzia – as Zofia also from PAN IGiPZ in Krakow – arrived at the station. He should accompany me to the second field-site next day, since Zofia had to return to Krakow because of pending work-duties.